Apr 1, 2015 › Categories: Got Beer? Well, they’ve done it. The dignity of craft beer has been spurned and the hipsters are in full control of our brewing future, though they probably were already in control of brewing before it was cool. This week, Narragansett announced its release of another hyper-local brew, All The Way IPA, a beer made with ingredients from the Olneyville NY System. I was tipped off by a friend of mine, Phil B, who had just gotten a sample pack into his store, which will go nameless for obvious reasons. He invited me to come in and take a taste of this new, possibly dubious, brew and I enthusiastically accepted and made all haste to his store. As with any ‘Gansett brew, this one came in a tallboy can and had art that reminded me of a chili cheese dog or a Sonic the Hedgehog level. 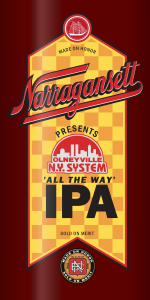 Before I get to the tasting notes I should probably tell you non-locals and basement dwellers what Olneyville NY System makes and dispel any questionable thoughts in your minds. Olneyville NY System is known for wieners, or “gaggers” in local parlance, wonderfully salty hotdog-like concoctions with celery salt, raw onions and meat sauce that make the perfect ending to any night of drinking. Saying “all the way” to a wiener man is telling him you want all the toppings on your wieners. The wieners are also prepared on the forearm of the chef so there might be a healthy dose of arm hair or possibly broken dreams mixed with sweat — it really depends on who’s working that night. So back to the beer. The can said it was an American IPA with a hint of celery salt, onion and meat sauce. That seemed benign enough so I felt no fear in trying it. The aroma burst forth from the can as a menacingly spicy flavor that might punch you in the face if you’re not careful. With all the flavorings the can mentioned, this did not surprise me. There was also a slightly less intense musky smell that reminded me of dirty socks in a locker room on a summer day. The first sip was a rush of intense hops followed by a salty/oniony aftertaste. Fortunately, the second sip mellowed out a bit and the meat sauce started to come through and balance the salt and onions. That was mildly pleasant for a few seconds. There were also some other flavors in there that were hard to identify at first, but it soon became apparent that it was the sweat and arm hair from working a long day in a wiener shop. If you’ve ever wondered what that tastes like, just lick your arm after sitting in a hot box on a humid 90+ degree day in the middle of July. Tasty, right? As a person intimately familiar with the brewing process, I cannot fathom how they were able to get the meat sauce to be in the beer, since brewing with meat is a big no-no for many reasons. I contacted Narragansett and they replied that it was trade secret, but proceeded to tell me how they got the authentic arm hair and broken dreams taste into it. In short, each wiener chef works a full shift and then puts both arms into a vat of wort (unfermented beer) for at least half an hour. This not only imparts a genuine flavor to the beer, but the wort works wonders for the skin, restoring essential proteins and moisture. It’s a very odd symbiosis that has emerged from this beer. I have been generally happy with the hyper-local beers that Narragansett has produced to-date, but I’m really not so sure about this one. I think it may have crossed the line of dignity and craft when they started to use real arm hair and meat to flavor their beers. Personally I think they should keep their dirty socks to themselves. But hey, if you’re into that type of thing don’t let me stop you … you could always strain your beer through dirty socks for all I care. All the Way IPA will be released during the month of July, just in time for the first heat waves to arrive and the April Fools to have gained some small bit of dignity back.